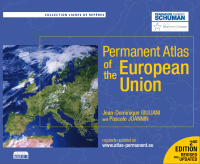 With a view to the forthcoming European elections, the Robert Schuman Foundation is making a new edition of its Permanent Atlas of the European Union available to all. The second edition of this unique book, prepared by experts from the Robert Schuman Foundation, provides a comprehensive and easily accessible overview of the Union, the euro area and each of its 28 Member States. It summarises most of the history and political and statistical realities of the Union and offers more than 50 physical and geopolitical maps of Europe.